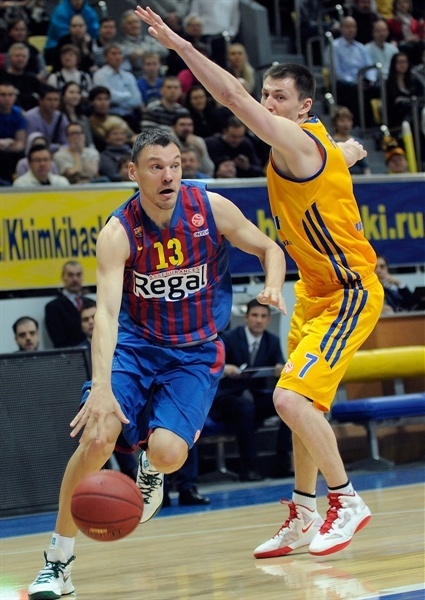 BC Khimki Moscow Region remained undefeated in Top 16 Group F by downing FC Barcelona Regal 78-65 at home on Thursday. 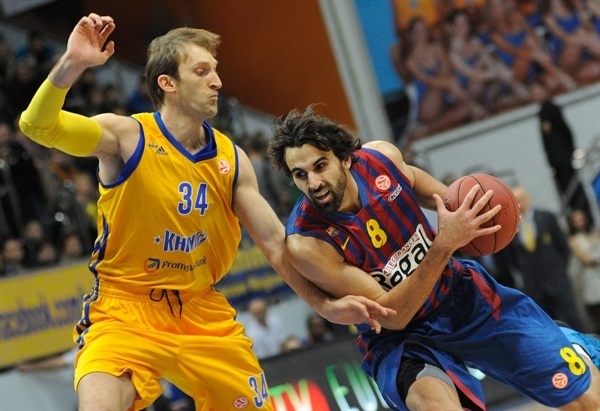 Khimki, which leads Group F with a 2-0 record, handed Barcelona its first road loss of the season. 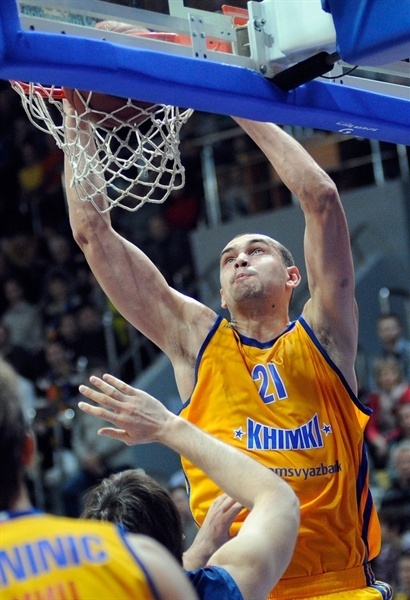 Khimki is undefeated at home in all three competitions – the Euroleague, VTB League and Russian League. Barcelona saw its 17-game winning streak in the Top 16 end. Barcelona had not lost in the Top 16 since February 3, 2010, 67-66 against Partizan. Zoran Planinic led the winners with 16 points and 6 assists. 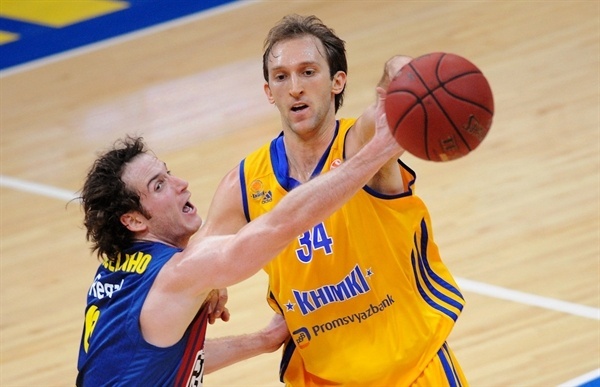 Vitaly Fridzon added 13 points while Paul Davis and Alexey Zhukanenko each had 10 for Khimki. Ante Tomic led Barcelona with 16 points. Pete Mickeal added 14 and Erazem Lorbek had 12. Barcelona was without scoring king Juan Carlos Navarro, who did not travel to Russia due to injury. An alley-oop layup by Marcelinho Huertas gave Barcelona a 14-15 lead, but Egor Vyaltsev and Zhukanenko gave Khimki a 21-18 edge after 10 minutes. Zhukanenko got some help from Fridzon to boost the hosts' lead to 38-29, but Sarunas Jasikevicius and Tomic kept Barcelona within 46-41 at halftime. 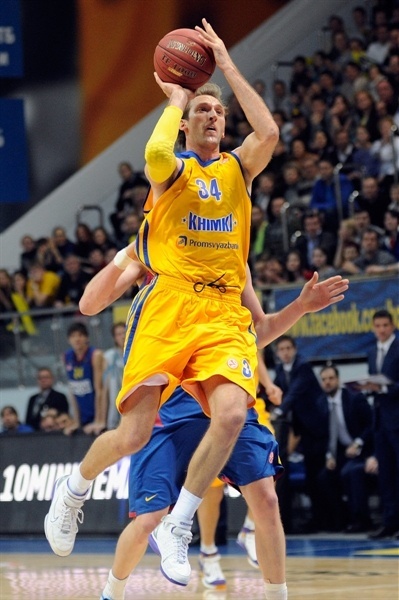 Planinic and Petteri Koponen helped Khimki make it a 14-point game, 62-48, late in the third quarter. Barcelona got within 62-55 at the end of the third quarter but Khimki held the guests scoreless for the next four minutes to seal the outcome long before the final buzzer. 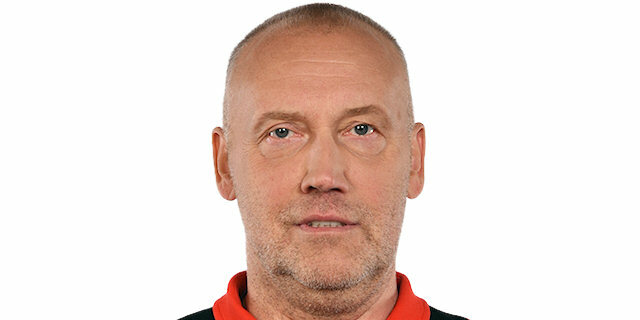 Khimki head coach Rimas Kurtinaitis surprised everyone by placing swingman Vyaltsev in the starting lineup for the first time this season. He got Khimki going with a running jumper, which Tomic matched with a jump hook. 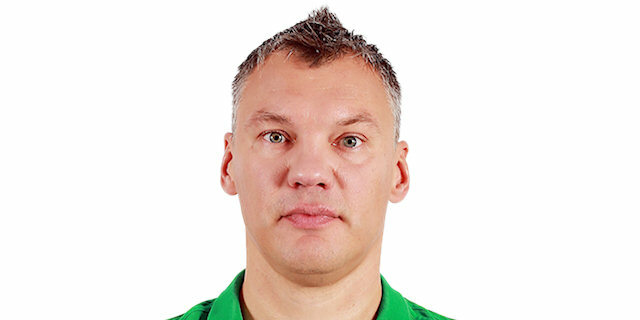 Sergey Monya struck from downtown, as both teams tried long possessions in the opening minutes. Joe Ingles finished one of those with a three-pointer that tied it at 5-5. 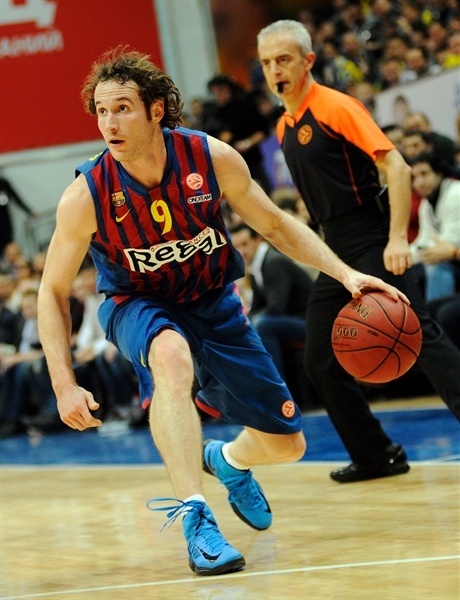 Kresimir Loncar shined with a layup-plus-foul, but Tomic scored again to keep Barcelona within 8-7. Mickeal stepped up with a put-back basket to give the guests their first lead, 8-9. 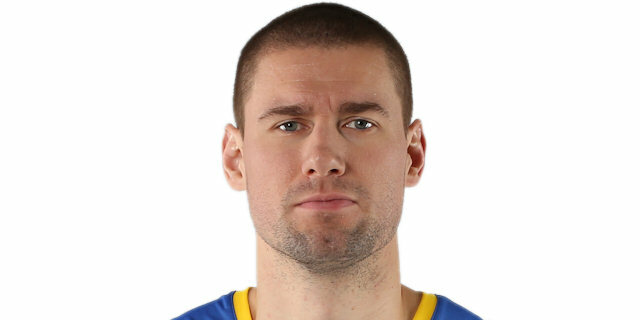 Planinic scored in transition and followed that with free throws to restore a 12-9 Khimki edge. Mickeal took over with a fast break basket off a steal and erased Planinic's foul shots with a driving layup. Huertas silenced the crowd with an alley-oop layup, but back-to-back baskets by Vyaltsev and Paul Davis gave Khimki a 18-15 edge. Ingles and Zhukanenko traded triples to fix the score at 21-18 after 10 minutes. 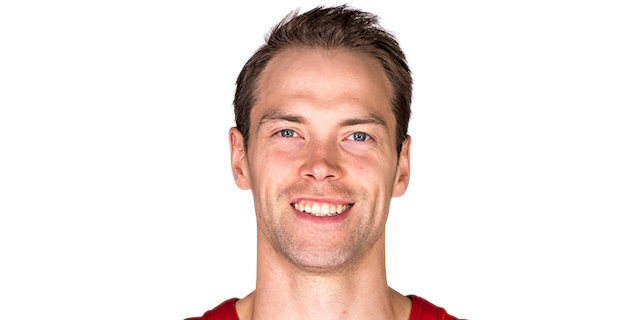 Lorbek buried a three-pointer early in the second quarter, but K.C. Rivers quickly answered from downtown. Lorbek kept pacing Barcelona with a jump hook. Davis hit a fallaway jumper for a 26-23 Khimki lead. Jasikevicius buried a baseline jumper, which Vitaly Fridzon matched with a close shot. Davis fed Zhukanenko for a power layup - and the free throw that came with it – and a fadeaway jumper by Koponen forced Barcelona to call timeout at 33-25. Huertas tried to change things with a wild driving layup and Jasikevicius banked in a close shot to bring the guests within 33-29. Koponen downed a six-meter shot and Fridzon nailed a stop-and-pop triple to boost Khimki's lead to 38-29. Jasikevicius scored again and a layup by Tomic saw Khimki call timeout at 38-33. Fridzon hit a mid-range shot, but Tomic followed a jump hook with a one-handed jumper in the lane. Zhukanenko ignited the crowd with an off-balance jumper and erased Tomic's free throws with a dunk. Planinic took over with a finger roll layup, but a jumper by Mickeal kept Barcelona within 46-41 at halftime. James Augustine, who had been scoreless until that moment, took over with a three-point play immediately after the break. Barcelona struggled to score and Khimki locked up the defensive boards with Davis and Augustine together on court. An off-balance jumper by Planinic made it a double-digit game, 41-31. 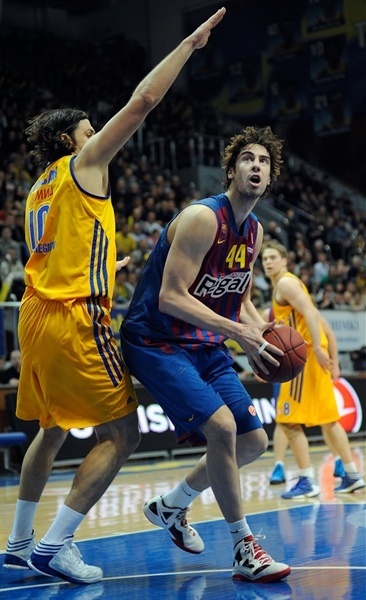 Lorbek tried to ignite his team's comeback with free throws and a layup by Tomic brought Barcelona a bit closer, 51-45. Augustine stepped up with a tip-in and a jumper by Planinic restored a 55-45 Khimki lead. Lorbek struck from downtown, but Fridzon provided a highlight with an acrobatic layup off a steal. 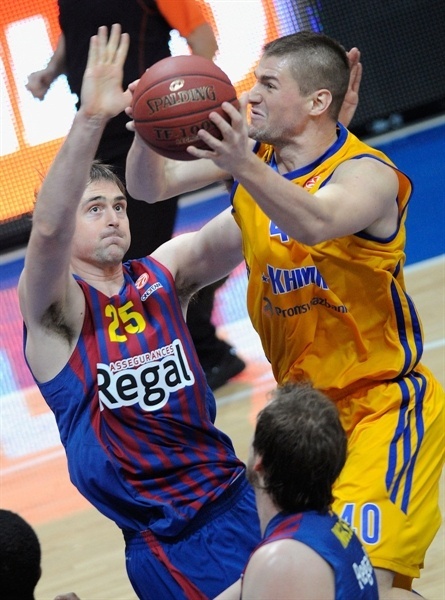 Barcelona tried to use Ingles to guard Planinic, but Khimki kept finding open shots. Koponen buried a three-pointer and followed that with a step-back jumper that boosted the hosts' margin to 62-48. Huertas made free throws, Mickeal fed Tomic for a layup and soon added a layup to bring Barcelona back to life, 62-54. A free throw by C.J. Wallace kept the guests within 62-55 after 30 minutes. Davis nailed a jump hook early in the fourth quarter and Augustine added a five-meter jumper, which gave Khimki some fresh air, 66-55. Barcelona struggled to score right when it mattered most and Fridzon shined with a power layup that forced the guests to call a much-needed timeout at 68-55. Planinic fed Fridzon for an alley-oop layup, as the hosts had started to use long possessions to run the game clock down. Barcelona missed 8 shots in a row before Mickeal stepped up with a backdoor layup. Davis answered with a fast break basket that Huertas matched with free throws for a 72-59 score with over four minutes to go. Davis made foul shots and a fallaway jumper by Planinic sealed the outcome at 76-59. 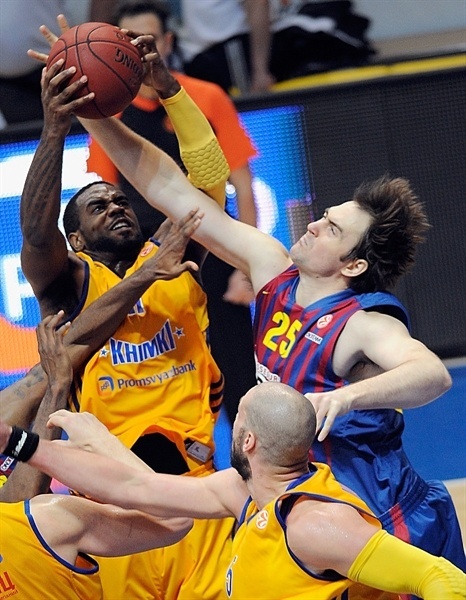 Barcelona kept trying, but the Khimki fans were celebrating a historic home win. Khimki stayed undefeated and got closer to the playoffs and Barcelona has plenty of time to bounce back and keep fighting for Euroleague glory. "I am very happy for the victory, which is very important. We played well in defense and in offense, and I am happy for my players who worked today hard, I don’t want to mark some players; we played good as a team. Today we made only 6 turnovers and that’s a good result. If we want to go forward we have to reduce the number of mistakes. We have good players and during 40 minutes with the concentration we may don't make turnovers. In general we played a great game and managed to keep Planinic in the game; he played 30 minutes and he was successfully substituted by Koponen and Rivers. We made a run in the second quarter. Now we play equal games and add from match to match. We realize our moments, make run when possible and try to preserve the result." "We lost our rhythm in the third quarter and didn't control the game. I think it was the key to our loss. Khimki played its own game, always organized. They hit a lot of shots and knew exactly at which rhythm they wanted to play. Their run at the beginning of the third quarter was the key to this game. That made us trail all the way from that moment and they felt more confident from then on. Not having Navarro affected us. He is a special player and very, very important to build our own game. This team is created to play with him and not having him affected us. We are in a tough group in which every game will be important, but I believe Khimki has a lot of chances to make it to the playoffs." "It’s a great feeling to beat Barcelona, like Real Madrid, CSKA Moscow and Panathinaikos Athens. I think we’ve established ourselves as one of the best teams in Europe and we have to continue playing in this way. We’ve played only two games, the Top 16 is very long, but for confidence and moving forward it’s a very big win. As for Navarro, he is a big part of the team but they have a lot of great players. I really believe we can move on to the playoffs; we are a great team, it’s a good task for us and we are happy with the outcome. Historically Barcelona is one of the best teams and it always plays for victory. Today our defense won the game. That was the key to success." 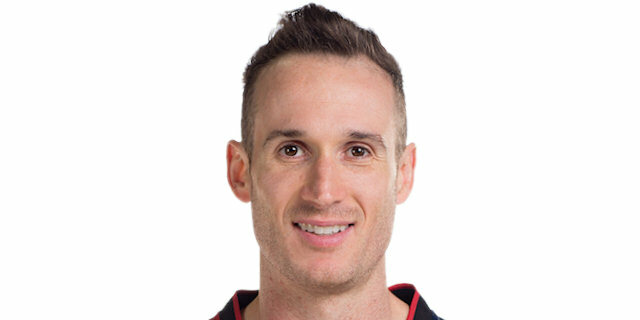 "It was a great game for us. We knew that at home we could beat any team of Europe. Today we played very good defense and I think it was the crucial factor of our success. 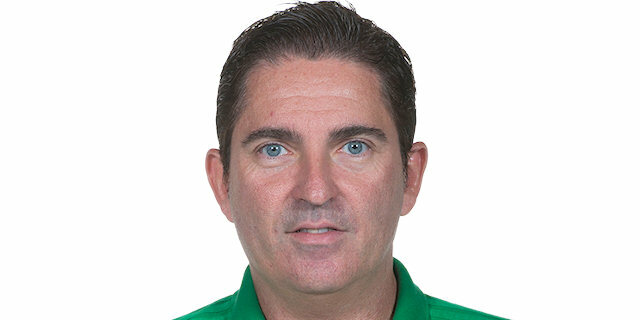 Of course, our opponent missed Navarro, who is a great player, he is important for them. But the only important thing now is that we beat Barcelona and everybody can say: ‘Okay, Barca missed Navarro so Khimki won,’ but I think we can also beat Barcelona with him. I’m very happy with this result: we started the Top 16 the right way with two wins in a row. We are playing better and better. Now it’s time to keep focus in this direction and try to win the next Euroleague game." "I don't know what happened after halftime. Khimki really increased its defensive pressure and played better defense. That's what we had to do and we didn't do it. It was much more difficult for us to score. Navarro is one of the best players in Europe and when you take him away from your team, it is going to hurt. We won some games without Juan Carlos this year, but at the same time, when he is not there we really miss him." "We played well in the first half, especially on offense. I give Khimki a lot of credit for scoring 46 first-half points. Our defense was not bad, but they hit a lot of tough shots. We improved our defense after the break, but our offense did not work well. We made a lot of mistakes, picked up a lot of turnovers in the second half and missed a lot of open shots. Our poor performance on offense led to this loss."